You are here: Home � All Deals , Retail: Clothing Toys Baby Shoes Children � Get a Leaning Tower of Pisa Miniature Replica Puzzle for $3.99 shipped. Get a Leaning Tower of Pisa Miniature Replica Puzzle for $3.99 shipped. 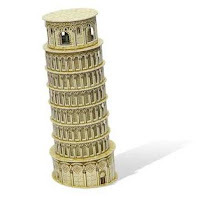 Meritline is selling a Leaning Tower of Pisa Miniature Replica Puzzle for $3.99 when you use coupon code: MLC400093111333T . For this price it would make a good stocking stuffer for Christmas morning. If you are expecting a massive challenge you will be disappointed in this puzzle, it's made to not be difficult. It actually comes with directions that would help you put it together step by step. Upon completion the model stands at 9.06" by 4.33". If you are interested in buying this puzzle for $3.99 click here.